Learn a new hobby or start a fun new side project!! After this in-person, modern calligraphy workshop, you will have all of the tools and knowledge you need to begin using a pointed pen and ink to create modern, beautiful calligraphy writing. No previous experience is needed. Everything you need to get started is included in this 2 hour workshop! Each attendee with receive a personal kit to use and keep after the workshop! This include an in-depth beautifully printed workbook, your very own Manuscript dip pen, the popular Nikko G nib and jar of ink! Learn basic modern calligraphy strokes that are the foundation of calligraphy letter formation. During this hands-on modern calligraphy workshop, you’ll receive one-on-one instruction, by a professional calligrapher/hand letterer in a class-size limited to 15 people maximum. At the end of the modern calligraphy workshop, you will take home your personal kit and practice on the sheets provided to get you ready for Modern Calligraphy 201! Check out what past students have to say after experiencing the Modern Calligraphy 101 workshop first hand! Looking for an advanced Modern Calligraphy Class?! Sharpen your Modern Calligraphy skills with this advanced workshop. This in-person workshop is a follow-up to Modern Calligraphy 101. 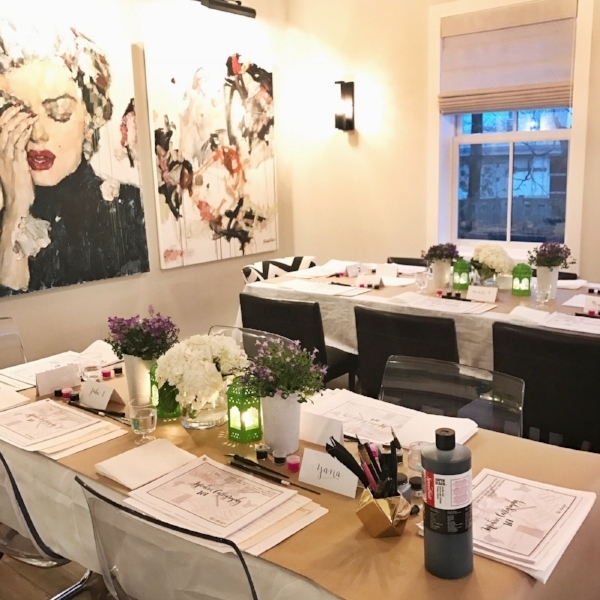 Attendees must have taken the introductory course in order to participate in this workshop or have experience using a dip pen and ink. During this in-person, 2 hour workshop, you will learn how to join letters using more flourishes and stylish flow. You will also learn how to create flourish accents and embellish your writing and finally we will practice writing a short quote to help you experience first hand, how meditative and calming calligraphy writing can be. In your personal kit, you’ll receive the Modern Calligraphy 201 work sheets, an upgraded adjustable oblique pen holder, a Zebra G nib, and ink along with practice sheets to help you improve your skill and confidence in calligraphy. You must have taken the Modern Calligraphy 101 workshop or have experience with a dip pen and ink to take these workshops. The basics will not be taught. Workshop dates for Modern Calligraphy 201 for 2018 will be announced soon! If you'd like to book or organize a private Calligraphy workshop or one in your neighbourhood, email nicki@lifeidesign.com to learn more!